High gales blow and vessels move in the background as you gaze the serene blue and white backdrop - some places are magical like that! 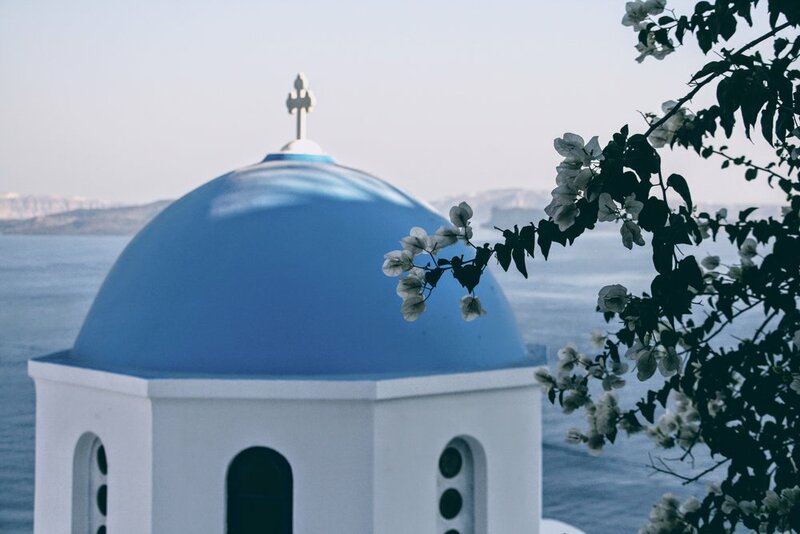 Santorini is probably the most known island in Greece but also represents a brand on its own. For romance or not, it's definitely a place you need to visit at least once. As you approach the island by boat, it's evident from the red-black volcanic backdrop that Santorini is quite a unique island complex (together with Nea and Palia Kammeni) formed by a volcanic eruption. The donkey trail up from Skala port may be steep and the road to the main settlements of Fira, Firostefani Imerovigli may be busy during spring, summer and fall - but that ain't no reason for spoiling your first impressions! The whitewashed cubic houses and the wild gales of wind swirling through the buildings add a theatrical note to your surroundings as your eye catches the unique view of the caldera. 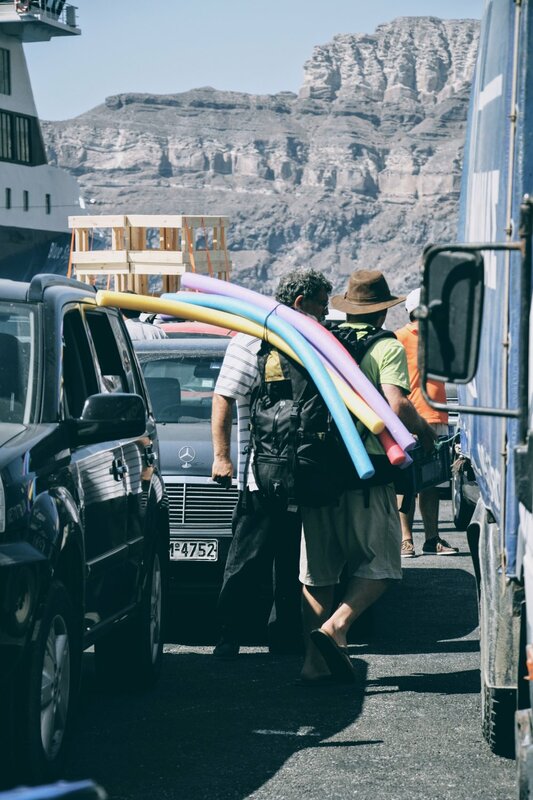 Fira is the main town of Santorini which is also busiest so it's best to avoid when you can. Home to numerous restaurants, bars and a few clubs, it's now gotten to the point of being ultra touristy although a walk along the coastline will reward you with some unique views. In fact, as you go towards Firostefani and Imerovigli it's best if you follow the uphill trail on foot (a good 25min trek) to get a sense of the local vibe. You'll notice that even from where Firostefani starts the narrow alleys become a bit more picturesque freed from the cacophony of merchant signs and other marketing props. Along the way to Imerovigli you'll find beautiful spots to take photos, galleries to visit and a whole loads of hotels. Visiting an old archaeological site, such as the one down in Akrotiri is always a nice chance for some exploration - the specific one being the ruins of a prehistoric village, quite close to the southernmost part of the island. Make sure you go early in the morning to avoid the heat and combine it with a visit to the infamous Red beach. Follow the hoards of travelers as they descend down to the sea level in the search of an umbrella spot - if not, then take the boat tour to the White and Black beaches which are also unique on their own. If you really love photography then make sure you stop by the Akrotiri lighthouse, built in 1982 and one of the most famous of the country, for a quick click before dusk. Perissa beach is another option, if you're into beach bars and up for some diving actions with the help of the local diving center. A couple of hours before sunset head up north to the traditional settlement of Oia and catch this unique place before tourists flock in. In recent years, there's definitely been a hype for Atlantis bookstore which opened in 2004 by a Brit who decided to move to Santorini for good, setting up the only bookstore at the time. Have a drink at Sun Spirit as the sunset goes down and crowds gather on the rooftops to watch the sun dip in before clapping in cheers (cheesy, right?!). Lately, Finikia has also started getting popular as travelers venture out of busy Oia. Black stone pavements and old ochre houses set a beautiful landscape in this peaceful settlement that's a good option for dinner. Domaine Sigalas - the best winery of the island, located outside of Finikia and offering a great selection of red, rose and white wines. Must also try their extensive food menu! Katina - one of the best tavernas in this tiny settlement just below Oia on Ammoudi beach, Katina has been serving travelers and locals alike for the past 30 years or so. Delicious fish and seafood menu! To psaraki - traditional Greek taverna in a nice setting next to the yacht club in Vlichada. Excellent food and very good service. Definitely taste the sun-dried tomato paste welcome dish! Meze meze - traditional taverna in the quiet settlement of Finikia near Oia, at reasonable prices. Try any of the eggplant starters!